Notionally, I’m a school physics teacher. I’ve worked in a variety of schools in north-east England and started recently as the PGCE Physics tutor at Newcastle Uni. I also write a whole load of textbook materials for schools, my biggest titles being A Level Physics books for Edexcel exam board courses. And I’m the inventor of the Best Fit Line Ruler. I ran a small business making and selling those but after ten years and 50,000 rulers, I’ve stopped making them. I have a major passion for writing fiction. My future-set series of novels, starting with 2089, is about a gently post-apocalyptic, Orwellian future England. You could say ‘sci-fi’, but it’s not really lasers and spaceships; ‘dystopian’ catches the themes well. 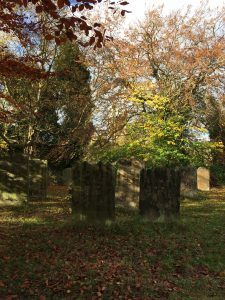 St Oswald’s Churchyard in Durham, England. Penfold and DS Milburn wander through here in The Cricketer’s Corpse. I’ve also developed a great series of detective novels featuring the duo Penfold and DS Tony Milburn. Based in Durham City CID, DS Milburn and his civilian foil, the kiwi surfer, Penfold, solve cases that take in high stakes such as murder and big heists, but in a very cerebral way. Holmes and Watson for the 21st Century, if you will. If you like podcasts, you can listen to this interview of Miles by Paul Teague in his series Self Publishing Journeys. There’s everything about my writing life, including thoughts on traditional publishing as compared with self-publishing, and crowdfunded publishing.